Includes unlimited access to all archived videos and materials following each live presentation. 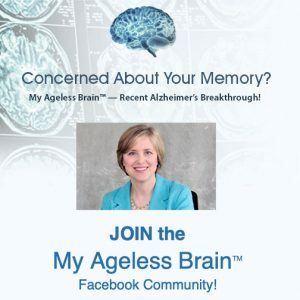 Identify the 6 major causes of memory and cognitive decline. Improve your mind, memory and whole body health in 10 evidence-based ways. *If you have a medical condition or take prescription medication, please consult your personal physician before making dietary or exercise changes or starting any herbs or supplements recommended in this program. Dr. Bredesen states that it takes “3-6 months of ‘living the protocol’” to see evidence of faulting or reversal of cognitive decline. Therefore, this program is 6 months in length to give you time to implement the key diet and lifestyle factors to optimize your cognition. 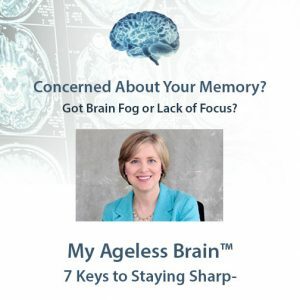 It also gives you time to assess the results you are getting and adjust the protocol while My Ageless Brain Live Webinar is available to support you. Each month, we’ll have 2 LIVE webinars, plus one LIVE “Town Hall Webinar Meeting” where Dr. Nancy will answer your submitted questions. 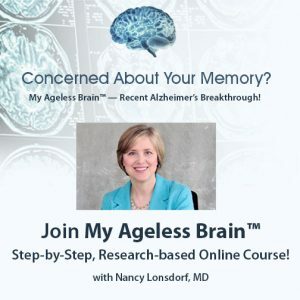 NOTE: For One-on-One Physician Support: Depending on your current state of mind-brain health, you may wish to do this webinar series on your own or supplement it by calling on your local physician to order the recommended tests, give you one-on-one feedback on the results, and advise you on optimal treatment. (This may also allow insurance coverage for some of the recommended tests, depending on your specific policy). 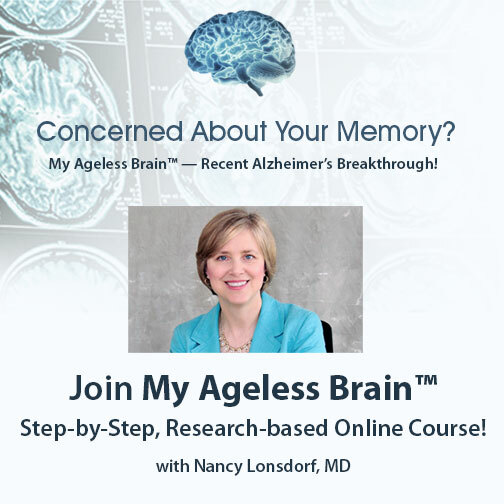 Dr. Nancy is also available to provide one-on-one physician support through her “Healthy Brain Recode Success Program”, if you are able to visit her in person in Iowa or California. She has been trained in person by Dr. Dale Bredesen and is an MPI Cognition-Certified, ReCode physician. Please call 641-469-3174 for details. **Important Note: Results will vary depending on individual differences, including age, current degree of memory loss, and other mental and physical factors affecting the potential reversibility of the underlying causes. No claims or guarantee are made for any particular health outcome. This is an educational program only, and you are cautioned to seek and follow your own physician’s advice based on his or her knowledge of your condition.